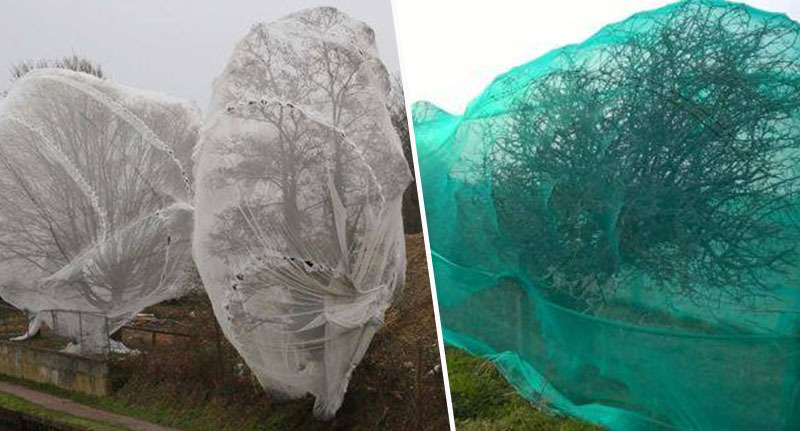 Huge nets have been encompassing trees across the UK, and people are outraged for the shocking reason why. Residents in Guildford have seen the ghastly netting covering 11 trees located on a derelict site, which has been earmarked for 191 homes. While in Stratford-upon-Avon, entire stretches of hedgerows have been trapped in green fabric, in an area set aside for a housing development. In Birmingham, trees at Solihull retail park were covered in the strange dressing. The sight is certainly baffling, and as well as being an eyesore on the landscape, it turns out the unattractive netting is being used to prevent birds from making nests in the trees. According to the BBC, the Royal Society for the Protection of Birds (RSPB) explained developers put nets on trees to make it easier for them to remove greenery when the time comes, because it’s an offence to destroy an active bird’s nest. However, using nets makes it easier for developers, as there are no laws against taking measures to prevent birds nesting in the first place. The UK has lost more than 40 million birds in the past 50 years, the RSPB report. The organisation have asked the government to address the shocking issue, which could cause more damage to the population of the animals. The awful scheme has been met with disgust from local residents, with many taking to social media to complain. One of several trees netted in Guildford to stop birds nesting. So upsetting. Developers putting nets on trees to stop birds nesting. It’s getting beyond ridiculous. Developers putting nets on trees to stop birds nesting. It's getting beyond ridiculous. The BBC report Dr Rob Lambert, an environmental academic from the University of Nottingham and vice principal of Nottinghamshire Wildlife Trust, said the public reaction ‘expresses the real connection we have with nature’. There is an incredible sense of ‘what have we become and why are we doing this?’. I can absolutely see the pressure housing developers are under but we have to find a way forward where nature does not come last. A petition has been started to protest the use of netting, which you can sign here.